Today, policy advisers from the Department for Business, Innovation and Skills (BIS) visited the University of Sheffield to discuss the Teaching Excellence Framework with senior management and Students’ Union managers. The Free University of Sheffield thinks that the Teaching Excellence Framework should not be implemented. It will promote competition between universities, rather than cooperation. It will lead to the bullying of junior academic staff. It will lead to PhD students, who are currently paid below minimum wage, being put even more pressure to work even harder. 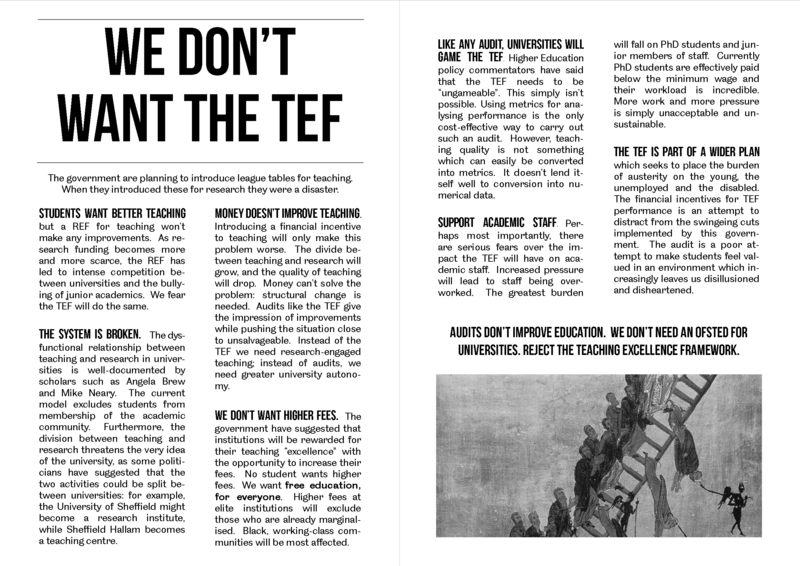 The TEF is about placing the burden on individuals rather than making structural change. It’s a poorly thought out initiative. It must be scrapped. Below are leaflets which we have handed out to senior management and advisers from BIS. Please copy, print and distribute these leaflets. For a PDF version, click here. Previous PostPrevious Veganism in a violent society.